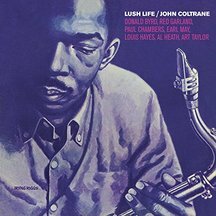 This is an important album, under his own name, from a time when Coltrane was playing with Thelonious Monk and Miles Davis. The majestic, sonorous John Coltrane can be heard at his 1950s best here. The piano-less trio with Earl May and Art Taylor of August 16 1957 is a delight. Legend has it that the pianist failed to show up for the session and so they just went ahead. Coltrane loved ballads and standards. ‘Like Someone In Love’ is played with a clarity and passion as is ‘I Love You’. They both sound like blues. Earl May on bass has a strong flexible sound and he partners Coltrane brilliantly. He underpins the music while Coltrane ranges all around the tenor. The two tracks of the real blues ‘Slowtrane’ and ‘Trane’s Slow Blues’ are the highlights. Just listen to the way that May opens’ Trane’s Slow Blues’ before the flourish of the clarion call of Coltrane enters. Art Taylor keeps in the background. This is quintessential jazz. ‘Lush Life’ is the main track from 1958. Coltrane at first plays the main theme straight. It is a difficult piece that few musicians had used for improvisation but Coltrane is undeterred. The track is nearly fourteen minutes long and probably presages some of the extensive musical expeditions he undertook in the sixties. Donald Byrd plays with a ringing clarity and makes us wonder why he is still under-rated. This is an essential album if you want to understand the work of Coltrane and where it came from.